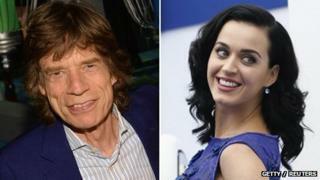 Image caption Jagger has said Perry must be "confusing him with someone else"
Sir Mick Jagger has issued a statement denying Katy Perry's claims that he made a pass at her when she was 18. Perry made the comments during an interview on Australian radio this week, while promoting new album Prism. She said the incident took place when she sang backing vocals for Sir Mick's 2004 song Old Habits Die Hard. But a statement from the 70-year-old Rolling Stones frontman said he "categorically denies that he has ever made a pass at Katy Perry". Perry, 29, told her interviewer, "I actually went to dinner with him one time and he hit on me one time when I was like 18. "But that was a long time ago and since then he's been very kind and I got to sing Beast Of Burden on his stage on their tour," she added. She was one of several singers to make a guest appearance on the Rolling Stones' tour earlier this year. When Perry was asked during the interview how she turned down an advance from a star such as Mick Jagger, she responded: "Well, you bring a friend and they do them. You sacrifice your friend."